Merry Christmas in July... This is my present to you (because I love my readers so much!) - a complete pattern for the Merry Stars Quilt! I designed this quilt a couple years ago and made a smaller version for my family. At the time, Christmas was fast approaching so I was forced to just give you a brief 'how I did it' cliff notes version of the pattern. Inspired by these adorable Christmas fabrics from Ink & Arrow, I decided to make a bigger and better Merry Stars Quilt and finally write a real pattern! I find that I am often fabric driven instead of pattern driven. I fall in love with some fabric first, and then I am obsessed to find (or design) a project to go with it. Are you fabric driven or pattern driven??? Anyway, this is the fabric collection that drove me to it. :) It's called Mingle & Jingle and right now you can find it all at Fat Quarter Shop. The corners of the Merry Stars Quilt feature my free Holly & Berries applique pattern. Make sure you download it from my Craftsy pattern shop before you get started. 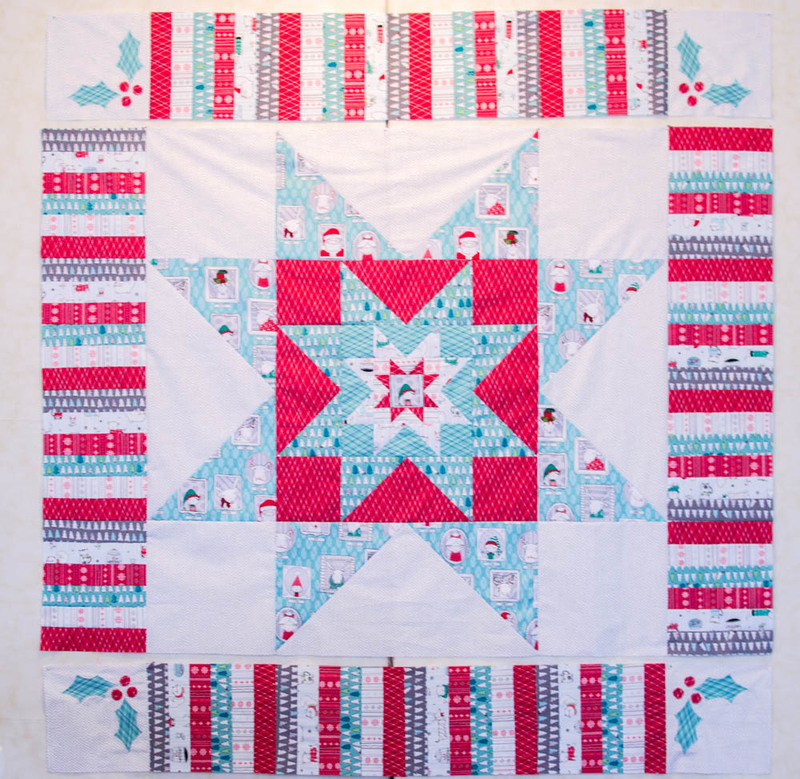 This new Merry Stars Quilt finishes at 67'' square - so it's the perfect 'snuggle quilt' size. Stitch one up to cuddle under while you read Christmas stories and watch holiday movies this year! I made this so you can right-click and print the image to look at as you cut. As you probably observed, the center of the Merry Stars Quilt is made up of 4 variable stars that are 48''x 24'', 12'', and 6'' squares. I sewed the first (6'') star block with a cute 3 1/2'' fussy cut elf in the center. After that, each star block will become the center of the next larger one. 1. Draw a diagonal line across the back of the 2 3/8'' squares that will make the points of the star. Pin 2 squares to opposite corners of the 4 1/4'' background fabric square as shown above. Note: this is a cutting line, so you can use a regular pen or pencil if you wish. 2. Sew 1/4'' away from either side of the lines, diagonally across the square. Then cut along the drawn lines. 3. Press the triangles open. Pin the last two small squares as shown above, and again sew on both sides 1/4'' away from the line. 4. Cut along the line again and you've got 4 flying geese units! I already trimmed off the 'dog ears' in the second photo above. 5. Arrange the flying geese units with the 3 1/2'' center square and the 2'' background corner square units as shown above left. Stitch together in three rows first. Then sew the rows together to make the block. Note: All piecing seam allowances are 1/4''. 1. Use the four 3 7/8'' and the 7 1/4'' squares to make flying geese units for the 12'' star. Assemble together with the first star block and the 3 1/2'' background corner squares. Stitch. 2. Use the four 6 7/8'' and the 13 1/4'' squares to make flying geese units for the 24'' star. Assemble together with the second star block and the 6 1/2'' background corner squares. Stitch. This is bigger than my mat now. And so quickly! 3. Use the four 12 7/8'' and the 25 1/4'' squares to make flying geese units for the 48'' star. Assemble together with the first star block and the 12 1/2'' background corner squares. Stitch. 1. Trace the Holly & Berries pattern on to the back of the Heat n Bond Lite to make 8 holly leaves and 12 berries (see cutting chart above). Fuse 2 leaves and three berries to a 10'' corner square piece as shown above right. Stitch around the shapes as desired. 2. Divide the twenty-four 2 1/2'' strips into 4 sets, each with 6 strips (one from each print). 2. Sew 6 strips together to make a strip set that is approximately 12 1/2'' x 42''. 3. Cut off the selvages and subcut the strip set into 4 pieces that are each 10'' wide. 4. Turn the strips and sew the 4 pieces together to make a piano keys border piece that is 10'' x 48 1/2''. Repeat steps 2-4 three more times to make 4 border pieces. 5. Arrange the center star block, the 4 corner blocks, and the border pieces as shown above and sew together. Quilt and bind as desired!